Img 1: The new Photonic Professional GT2 3D printer enables the production of larger structures with higher precision in shorter times. Img 2: Filigree structures up to the millimeter range can be printed with the highest resolution. With the successor model Photonic Professional GT2, Nanoscribe, the world's leading manufacturer of 3D printers for microfabrication, offers new solutions for additive manufacturing and maskless lithography. Thanks to optimized hardware and software components as well as IP-Q printing material especially developed for larger volumes, high-resolution microstructures up to a height of 8 mm can now be produced for the first time. While Nanoscribe devices have always been optimally suited to the additive production of the finest structures, objects with submicrometer details from typically 160 nanometers up to the millimeter range on a printing area of up to 100x100 mm² can now be produced in a very short time. 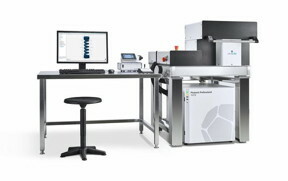 The new Photonic Professional GT2 3D printer can significantly shorten product development cycles, especially in cases where large-volume structures in the millimeter range are required, such as for microfluidic elements (filters or nozzles), lab-on-a-chip applications, or micro rapid prototyping. In the field of sensor and actuator technology, various product components can now be printed quickly and precisely on MEMS components or silicon chips without further adjustment or assembly processes thanks to the variety of printable substrates. Photonic Professional GT2 systems will also open up completely new possibilities in the field of medical technology, such as the direct printing of micro-optics on glass fibers for minimally invasive endoscopes or the manufacture of microneedles for painless drug delivery through the skin.